This Jeffery and Paula Print dress was in the sale on the Simply Be site when I was lonely in Turkey, and I couldn't resist making a little purchase! 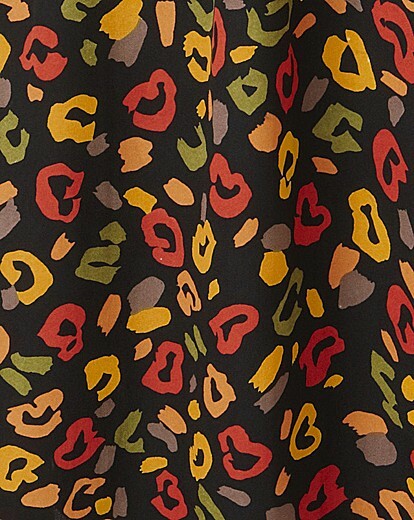 The print really intrigued me - a cross between animal print and lipstick prints! It is that common scratchy polyester fabric, with a simple gather under the bust. I pulled it on in a rush this morning when my first choice did not spark my imagination! The print leapt from my wardrobe and I knew it was the right choice! Due to the scoop neckline, it looked very plain without some necklace adornment! So my under used baroque style statement (as statement as I get) necklace came out to play! I'm wearing with my simple black ballet pumps so I'm comfortable for running about the office. A simple, but soon to be trusty, outfit I think. Oh wow. Not seen that before, I love that pattern! I love that it's a multi-coloured pattern, it looks great on you!